Smart speakers are found almost everywhere these days. While Amazon had the head start with its Echo lineup of devices, Google soon caught up to it with the Google Home range. While these two are the big dogs in this league, many other competitors in the tech world have been trying their hand at smart speakers, including the likes of Alibaba and Xiaomi. Apple did not see much success with the first-gen HomePod. Now, Samsung, which already has its own smart assistant in the form of Bixby, is gearing up to launch its own smart speaker. While details are still scarce at the moment, a recent patent from the company might give us some insight on what to expect. As reported by LetsGoDigital, Samsung Electronics filed a patent application with the WIPO (World Intellectual Property Office) on 21 November 2017 for an electronic device for controlling microphone parameter. The patent was published on 31 May 2018 in the WIPO database. The patented smart speaker is an advanced device with a total of 7 microphones. The housing consists of two parts in which the upper part can rotate a complete 360 degrees. Each microphone on the device can receive separate sound information, allowing it to accurately detect where the sound is coming from. 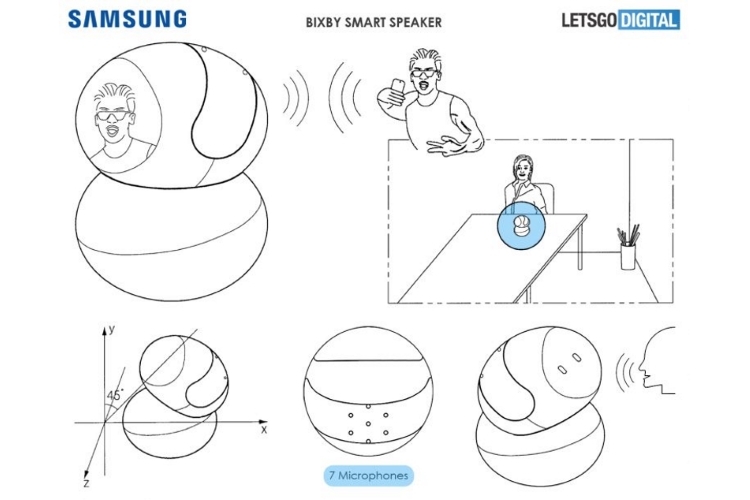 The smart speaker then turns in the direction where the sound comes from, which helps in speech recognition. Apart from that, the speaker also features a camera, that has the ability to recognize the face of the user. If the face is in the memory, this person is automatically seen as the source of the sound. This way, the camera can also be rotated in the direction of the user. The Bixby speaker can react to your commands by producing sound, and also by displaying text and photos on the built-in display. The screen offers touch functionality and is also able to recognize certain gestures. Additionally, the patent further describes the option to give hover input via a stylus pen. Additionally, the smart speaker can also receive and send data to a smart device, such as a smartphone or tablet. Users also have access to a media player, internet browser, email, photo album, and alarm. The device is equipped with a mobile module, LTE, WiFi, Bluetooth, NFC, and GPS. While a company’s patents don’t always make their way to the final product, the above descriptions certainly make for a compelling device. 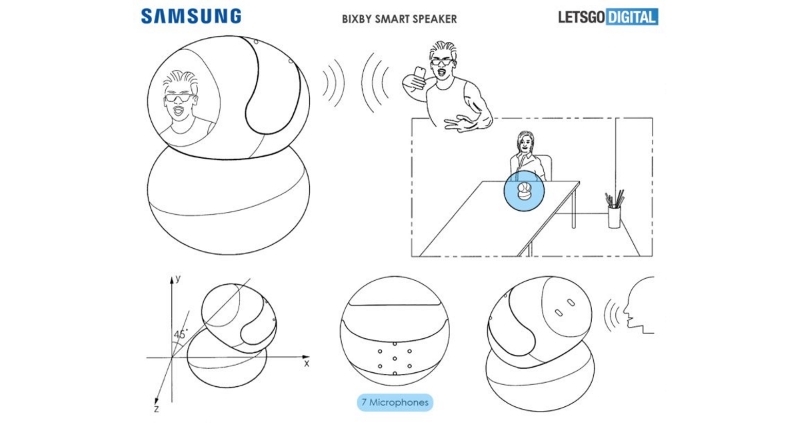 It would certainly allow the Samsung Bixby Smart Speaker to stand out in the current crop of smart speakers. While DJ Koh, CEO of Samsung’s mobile division, had stated of a Bixby speaker back in MWC 2018, we still do not have any details about the product’s actual release date.